Markets around the world fascinate me. Partly it's the food, and partly it's because markets are where local life and local business boom. 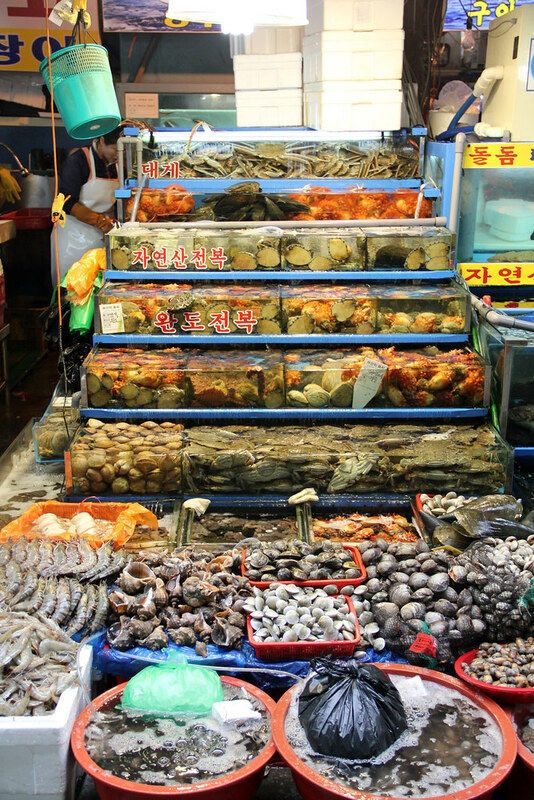 One of the first things I did when I got to Seoul, South Korea, was head to the Noryangjin Fisheries Market. Similar to Tokyo's Tsukiji Fish Market, the market is one of the largest fresh seafood sources in the city. Every day, thousands of people come in and out of the market in search of the freshest and highest quality of seafood. There was indeed an impressive display of some of the finest seafood I've ever seen. 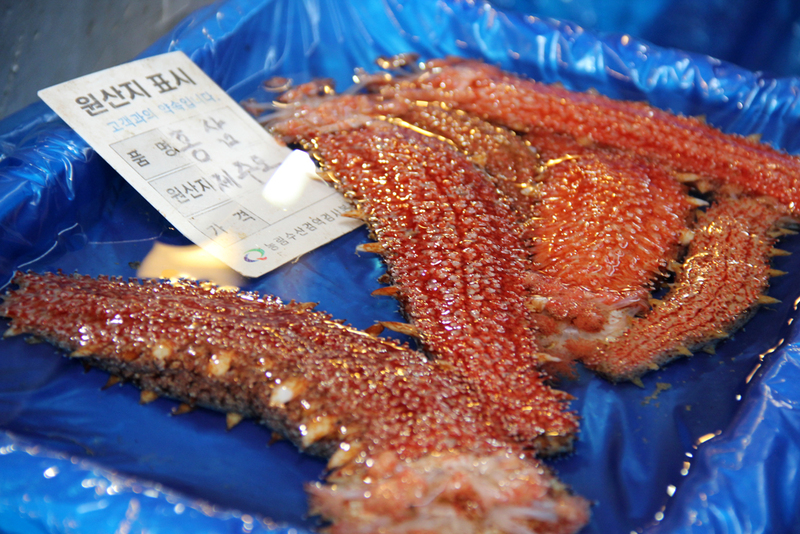 Octopus is one of Korea's most coveted culinary gems. 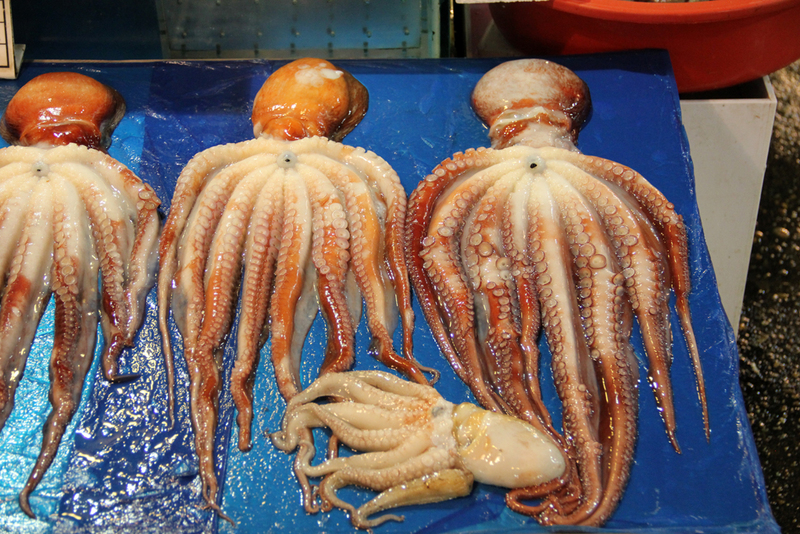 From eating live baby octopus chopped and moving on your plate to giant tentacles stir fried with chili paste, you'll find it all at the market. There are lots of slimy things! There are all sorts of random slimy looking things like sea cucumbers, and some things I'd never even seen before. If you love shrimp, you'll be in awe at the selection. I couldn't believe the size of the jumbo prawns, some of them easily a foot in length, and probably offering more meat than a small lobster. YUM! These rather intimidating little guys are known as sea squirts. When vendors slice off their hard outer shell, a squirt of water shoots out, sometimes over a meter in distance. 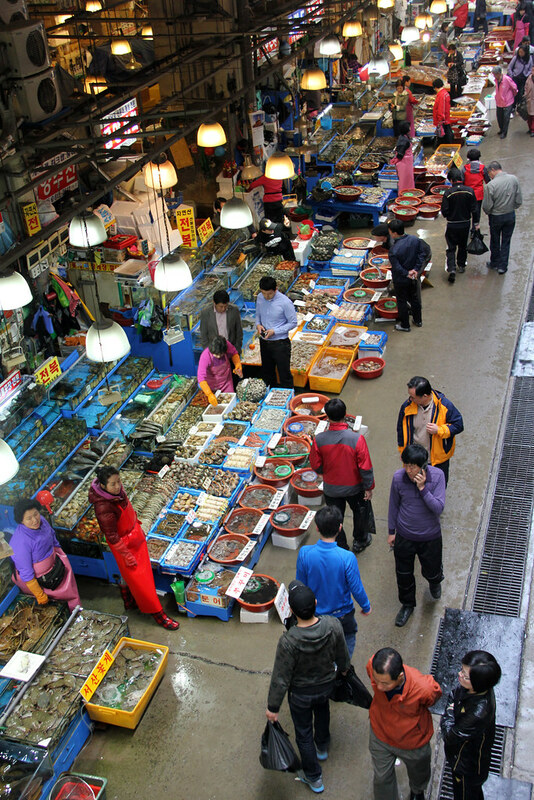 The seafood at the Noryangjin fish market is filled with aquariums where almost everything is still alive and swimming! This man was choosing his lunch very carefully. Along with a host of slimy sea dwellers, mollusks, and crustaceans, there's also a giant selection of fish including lots of stingrays waiting to be sliced up and eaten as sushi. After browsing around the Noryangjin fish market you can go to one of the upstairs restaurants and treat yourself to a delicious meal. I ordered a fish soup hot pot flavored with kimchi and cabbage – it was fantastic. You can also sample other delicacies like sashimi, and even live octopus. 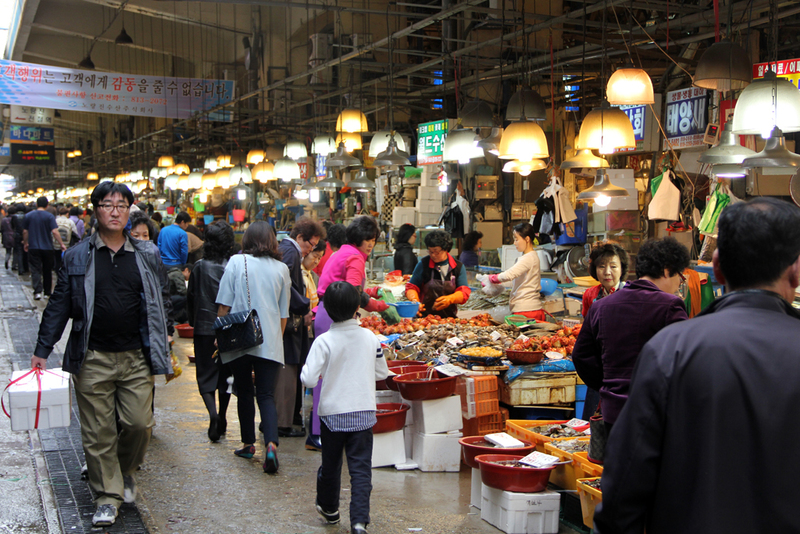 If you visit Seoul, South Korea, make sure to include the Noryangjin Fish Market on your itinerary. Wow what a fascinating market! 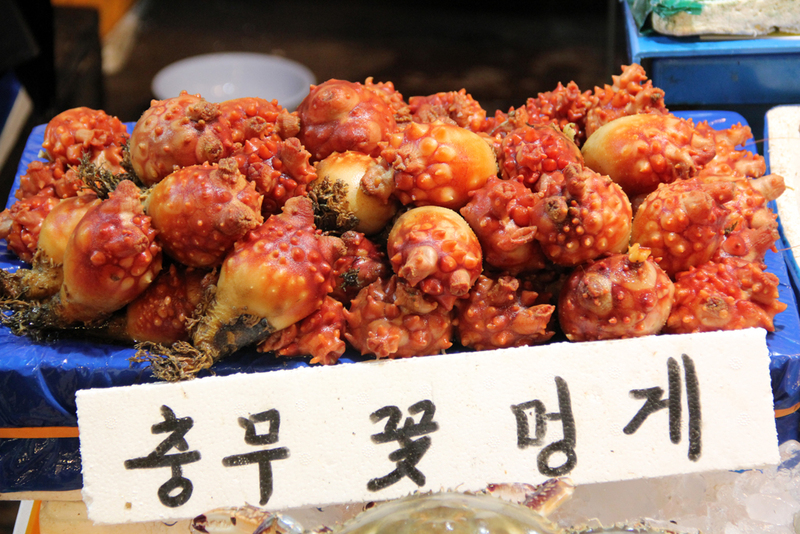 I see many delicacies that I enjoy (octopus, squid, various forms of fish) but there are quite a few like the sea squirts that I would love to try out! I’m more particular to the farmers markets in Central & South America myself…as a big fan of exotic fruits, there’s never a short supply to be had! I agree Ron, sampling all sorts of new and exotic looking things is one of the best things about traveling! I’m not much of a seafood fan but I love wandering around fresh food markets. This one looks really interesting! Hey Dean, this market is definitely interested even if you’re not too much into seafood! 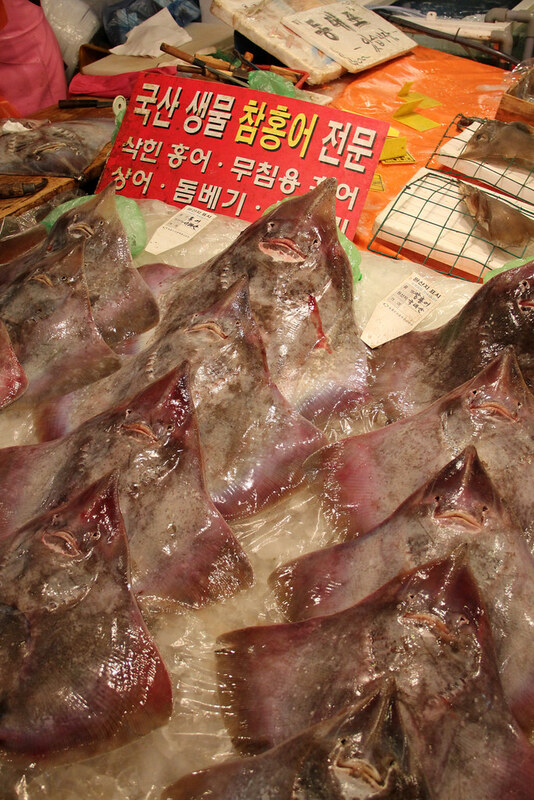 I liked going to that market for the experience…but in actuality, all the raw seafood, still alive fish and blood and guts on the ground kind of grossed me out! Sounds like you had a better lunch than me too…I went to one of the restaurants below the market and they cooked the fish we bought, but it sounds like the ones upstairs had a better menu! Glad to hear you also visited the fish market Andrea. How did they prepare the fish for you? I wanted to do it that way as well (buy fresh seafood and bring it to a restaurant) but I just wasn’t sure how much they would charge… so then I just ended up looking at a menu and ordering. Great post. 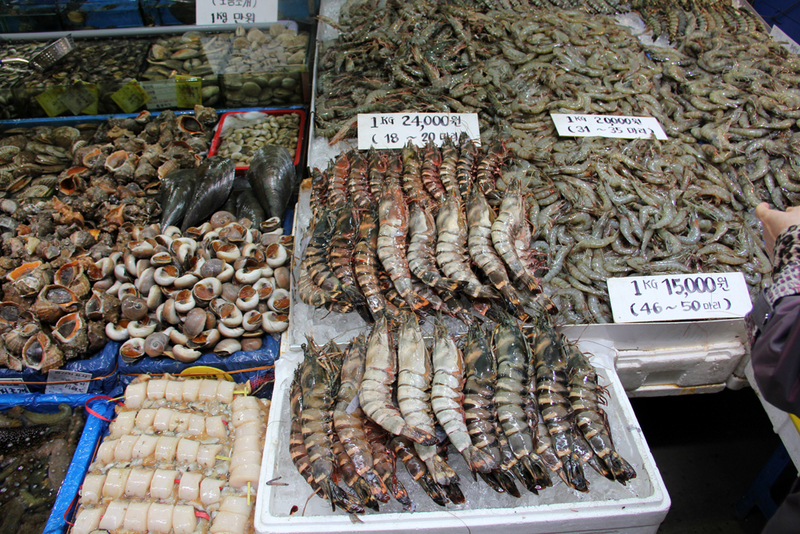 I love seafood markets. I’m been to Seoul but I missed this one. 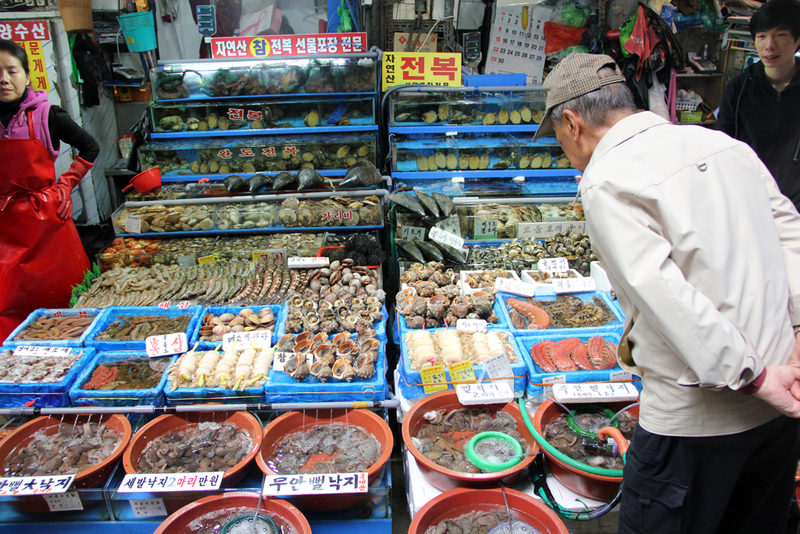 Down in the south, in Mokpo, they’ve got a great dried seafood market. Cool, Stephen, I would have loved to go down south as well – I bet there’s some great tasting dried seafood in Korea too! This is insane. I would love to visit a place like this. Well, I should say my husband would love a place like this. I am sure he would buy all the weird stuff just to taste it. Ray sushi? My husband would eat that too? Awesome to hear that Ruth!